New Zealand trainer Michael Pitman is hoping his classy filly Savvy Coup will help him have the last laugh at Royal Randwick on Saturday after being on the other end of some light-hearted gentle ribbing in the past week. Savvy Coup's co-trainer Michael Pitman (Pic: Trish Dunell). Fortunately, Pitman has a decent sense of humour and he recalled an exchange with a worker at Randwick as he prepares his filly for the Group 1 $1m James Boag’s Australian Oaks (2400m). Pitman, who trains in partnership with his son Matthew, arrived in Sydney from Christchurch last Wednesday with Savvy Coup. “The crossing keeper at Randwick said to me the other day ‘where do you come from mate’ and I said Christchurch,’’ Pitman said. Whether Pitman pointed out that he has brought horses to Sydney with success in the past, or just left it at that, he didn’t say but he’s confident he has a smart filly in Savvy Coup. The road for a New Zealand filly to the Australian Oaks is already well established so Pitman saw no reason to reinvent the wheel and pointed his charge at the Lowland Stakes (2000m) and New Zealand Oaks (2400m), and won both, as the steps to Randwick. It’s the same program used by Murray Baker last year with Bonneval and, also, by 2016 Australian Oaks winner Sofia Rosa. “It’s a well-worn path going through the Lowlands to the Oaks then the Oaks here,’’ Pitman said. “She has a good turn of foot, her sectionals have always been pretty quick. She has good tactical speed that a lot of horses don’t have. Savvy Coup, $7 with TAB in the Oaks, is something of an iron filly having been in work all season and since she resumed in September the only month she hasn’t contested a race is February, though she raced on January 27 and March 1. She started the campaign as a maiden and Pitman thought he made a mistake refocusing on the Oaks after originally setting her for the 1000 Guineas in the spring. “I said to the owners way back in September I didn’t think she was a Guineas filly and was more an Oaks filly,’’ he said. “She disappointed a couple of times early in the campaign so we decided to pull her out of the Guineas. Then of course she came out both days of the Cup carnival (at Riccarton) and she bolts in. “I was a relieved person when she won the Oaks because I thought, after she won those races, I cost the horse winning a Group 1 event by not running in the Guineas. Savvy Coup, stabled with Ron Quinton’s team, worked over 2000m at Randwick on Tuesday and Pitman said she’s a very fit filly and should have her chance in the Oaks. There are four Kiwi fillies in the Oaks this year including NZ Oaks runner-up Contessa Vanessa, trained by Graeme Rogerson, Tony Pike’s She’s A Treasure, who ran sixth in the Adrian Knox last weekend, and NZ Derby placegetter Danzdanzdance. Pitman is confident she has the measure of her compatriots. “Each time she’s raced against Contessa Vanessa she’s beaten her,’’ he said. 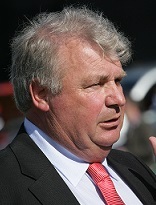 Pitman has trained over 1700 winners, only Graeme Rogerson and Dave O’Sullivan have trained more in New Zealand, and won three premierships. Savvy Coup’s jockey Chris Johnson has been riding for him for 35 years and when Hugh Bowman wasn’t available to ride his filly Pitman had no hesitation in keeping the association with Johnson going. It’s not a bad record for someone who was told he was wasting his time when he started training – Pitman spent the first six months as a trainer lying in a hospital bed due to a “badly smashed up leg’’ which was replaced with an artificial one.